I lost a dear friend. 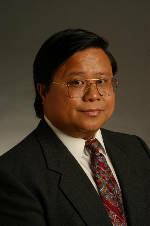 Ruperto Elpusan, Jr. passed away Thursday, January 10, 2013, at the very young age of 56. Ruperto was an expert gun handler, firearms collector, accomplished author, respected colleague, firearm instructor, martial artist, businessman, inventor, a law enforcement officer, a family man and a dear friend. He was a driving force in the gun training business. He was envied by some and imitated by many. Ruperto was never selfish with his knowledge and ideas. He was funny, witty, generous, honest, smart and sincere. I will miss our regular lunch meetings, out of town training travels and constant sharing of information and fresh outlook. His family and kids were his whole world. He would turn down business because he needed to be with his twins whether for tennis, basketball, or any other activities. I'm usually the beneficiary of those business referrals. I appreciate the business but above all, his confidence in me to provide good and comparable service to his students. I met Ruperto at a gun training class. After which we collaborated on a few classes of our own. He became busy with duty as a corrections officer and his various trainings to further improve his knowledge and skills. He was also busy with his gun training business which provided basic safety as well as advanced courses that caters to both civilians and security personnel. Ruperto is survived by his loving wife and twin daughters Eman and Tia. Be Safe Gun Training and Academy Security Training are now ran and managed by his widow, Lula, who has been on Ruperto's side since the business started. Rest in peace my friend, you will be missed. Shoot Safe Learning Located in South Bay, Southern California. Dedicated to promote safe firearm handling and responsible gun ownership. Classes are conducted at So Cal Sharpshooter in Torrance, California. Other classes and safety courses are conducted in Los Angeles, Chino Hills, Asuza, Carson, Long Beach, Redondo Beach, Lakewood, Corona, Huntington Beach, Lomita, Hermosa Beach, Beverly Hills, Palos Verdes, Rolling Hills, Gardena, Harbor City, Wilmington, San Pedro, Hawthorne, Lawndale, LAX, Saugus, Santa Clarita, San Fernando Valley, Valencia, Inglewood and Cerritos.